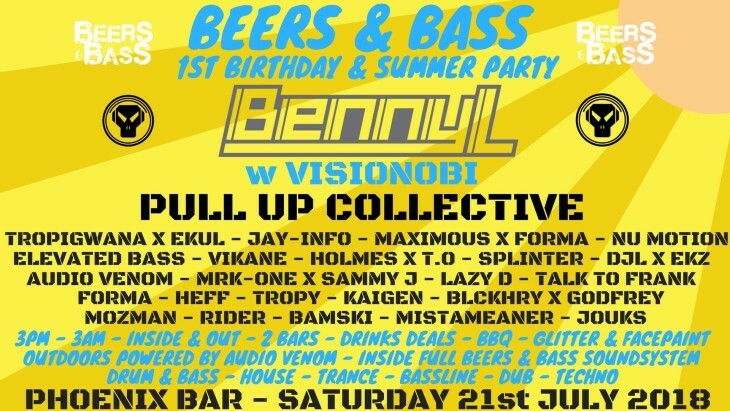 12 hours of MUSIC across the main room & garden area, BBQ food, face paint & glitter, bars inside and out and of course 3 MASSIVE HEADLINERS **BENNY L, VISIONOBI & PULL UP COLLECTIVE** with support from us at Beers & Bass and all the local crews.. Audio Venom, Elevated Bass, NXGN, NU:Motion & many more! Expect the best Drum & Bass, House, Trance and Dub Music across 2 rooms!